The Carnival Spirit has been slightly damaged by bad weather and its homeport of Sydney, Australia is closed too. 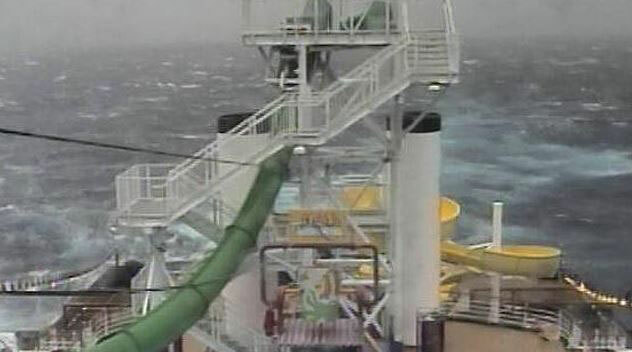 It’s being reported that the Carnival Spirit was badly damaged from one of the regions worst storms in a long time. The Spirit class cruise ship was coming to an end of a voyage but before docking back at its homeport at Sydney Harbour the vessel was hit by strong weather conditions that caused high waves, strong winds and heavy rain. Sydney Harbour was also hit by the bad weather and as a result was forced to close the port today (Tuesday April 21st). The scheduled Sydney arrival of Carnival Cruise Line’s Carnival Spirit early this morning has been delayed due to severe weather which has led to the closure of Sydney port and prevented the Harbour Pilot from boarding the ship. The ship is now sailing off the Sydney coast until the port is reopened and the Harbour Pilot is able to board. It is a mandatory maritime requirement for a Harbour Pilot to board any cruise ship before it enters Sydney Harbour. Carnival Cruise Line is in close contact with the Port Authority of NSW regarding when the port will reopen. The Port Authority has advised that Sydney port will not reopen tonight. Carnival Spirit is returning from a 12-night cruise to New Caledonia, Vanuatu and Fiji and is carrying 2500 guests. The ship is continuing to offer a full program of onboard activities and entertainment and the Captain is ensuring guests are as comfortable as possible while the ship waits for the Harbour to reopen. Carnival Cruise Lines has stated that the ship won’t be able to dock in Sydney until tomorrow morning the earliest. The bad weather has stopped the port pilot from being able to get onboard any vessel. The Port Authority are keeping on contact with the cruise line on when the 88,500 gross ton cruise ship can dock. Until then the passengers and crew onboard the Carnival Spirit are stuck out at sea with the ship damaged. As a result of the Carnival Spirit unable to enter Sydney Harbour passengers on the next scheduled cruise will have to wait. The cruise line states that the Captain is currently working on a revised itinerary which was originally supposed to be a 8 night Pacific islands cruise departing from Sydney on April 21st. The voyage was expected to call at destinations in Caledonia and New Caledonia before arriving back at its homeport on April 29th. Carnival has stated that the cruise will change to a 7 day voyage but this is a developing situation and could change again depending on the Spirits arrival into Sydney tomorrow morning.